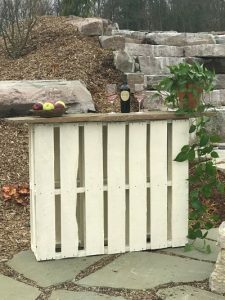 Mulder’s Landscape Supplies is happy to offer step-by-step instructions for creating a one-of-a-kind bar using repurposed pallets. We are proud to be your supplier for landscaping supplies and hope this DIY pallet bar will top off your space in a functional, yet fun way! Enjoy! The trend of repurposing pallets into home accents and other uses far beyond their original design is still going strong. And, it’s no wonder why! 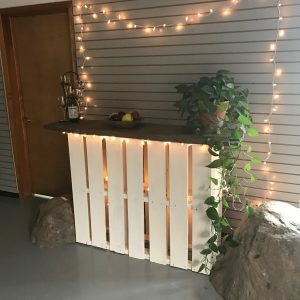 Not only is upcycling pallets of all conditions fun and economical, it’s also a “green” way to create unique and functional conversation pieces. Barring a shortage of pallets, the limits of what do-it-yourselfers can create in a few hours is only limited by their know-how and imagination. The next time you spy a few pallets in need of a new purpose, consider building your own pallet bar. With these easy-to-follow instructions, you can create a one-of-a-kind and functional piece of furniture. On top of that, it’s sure to be a hit at your next garden party or backyard cook-out. Start by selecting your pallets. Remember, the pallets themselves don’t have to be perfect. A few imperfections will give the finished piece additional character! Just make sure that the pallets match in terms of size and style. Next, select a stone slab or pavers to serve as the top of the bar. The width of the bar top should be 1-2” wider than the pallet structure it will be affixed to. Measure the height of your pallets in a stacked position and add 4” to the total. For most pallets, you come up with approximately 13” total. The stone top can overhang longer at each end according to your preference. Large brick pavers can be used like tiles on a countertop. Common sizes include 16×16” and 18×18” squares. Natural stone pieces are another option. If you fall in love with a particular piece of stone only to find that it is too large, you can always have the stone cut to size. Once you have the bar top selected, choose a coordinating color of paint for the pallets. Keep your intended use for the bar in mind when selecting the type of paint, too. For example, if you plan on the bar being outside where it will be exposed to the elements, an exterior paint will be your best bet. A bar destined for inside or covered use can be coated with indoor paint. Now that all the decisions have been made, it’s time to get your hands dirty! 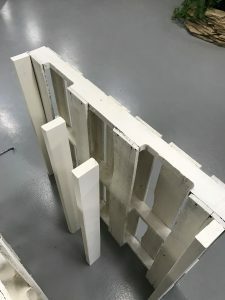 For assembly, the pallets will stand on their side (so that the series of boards that once served as the pallet’s surface will be perpendicular to the ground). In this position, measure the height of your pallet. Cut four lengths identical to the height of the pallets from your 2×4” boards. Prepare the pallets and the four pieces of 2×4 for painting. 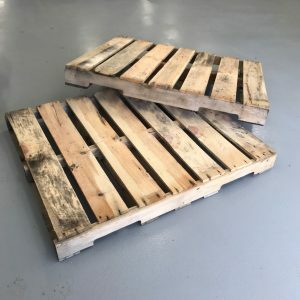 Depending on the condition of your pallets, you may need to power wash the wood to remove dirt, grease, or other substances prior to painting. Once all the surfaces are clean, paint all the wood surfaces. Be sure to paint the inside and backside of the pallets as well as the 2×4 pieces. You may need to apply additional coats for total coverage or opt for a more rustic, weathered look. Again, the choice is yours! After the paint has dried and you are satisfied with the coverage, begin attaching 2x4s to each of the pallets. Lay each of the pallets face down. On the first pallet, use screws to attach the 2x4s to the outer edge support of the pallet, running in the same direction as the face-side boards as shown above. Next, attach the remaining two 2x4s to the inner supports using landscape/construction adhesive as shown below. Lay the second pallet on top of the exposed 2x4s to help weight the 2x4s to the lower pallet as it dries. It may be necessary to clamp the two pallets together while drying. 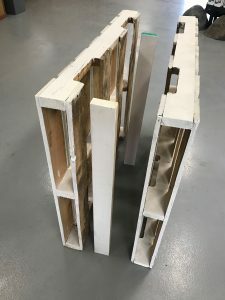 Once the adhesive has dried on the lower pallet, make sure that the finished face of each pallet is outward facing and attach the second pallet to the 2x4s by gluing the inner boards and screwing the outermost boards. After pallets are secured to create a base, it’s time to install the bar top. Depending on the stone or pavers used the weight of the entire piece, you have two options. You could just rest the stone on top or use the landscape/construction adhesive to secure the bar top to the pallets for added security. Consider your desire to move the finished bar and the length of overhang on either end of the bar to help decide if your bar is best suited for slight disassembly and easier moving or a sturdier, yet less easily repositioned. Whatever you choose, don’t be afraid to dress up the finished piece for some addition customization. String lights around, under, and through the pallets help set a party mood; plant or flowers present a welcoming aesthetic; and a hidden hook for a bottle opener or bar towel make entertaining even easier. The specifics are up to you. Now grab some refreshments and try out that new pallet bar! Be sure to share your finished project with us by email or on Facebook. We’d love to see how your pallet bar turned out! And remember to contact us for all your landscaping needs!